Size of Male: 40-60 lbs., 11-15 in. Size of Female: 40-60 lbs., 11-15 in. 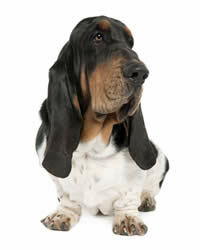 The Basset Hound is a short-legged, long-bodied, stocky dog with drooping ears. When this voracious sniffer is not on a hunting spree, it tends to be a laid back, gentle companion. You’ll know one when you see one. It’s the breed that models the famous “Hush Puppies” brand. “Basset” comes from the French word “Bas” which means “dwarf” – a fitting description indeed for this short-standing dog. In the early 16th century, many dwarfish dogs were interbred to produce the present-day breed. The Basset Hounds’ short stature allowed them to stay close to the ground and sniff the trails of prey. Their stocky build and slow gait made them easy to spot for their human companions. Bassets became notably popular during the reign of Emperor Napoleon. In the late 19th century, they were transported to America where they caught the eye of advertisers and established a huge fan base of pet owners. It is odd to find a Basset that is aggressive. The breed is one of the gentlest and the most amiable in the canine world. Inside your home, they tend to be lazy and docile. They are kind to children, strangers and other pets. Outside, this dog breed is quite a determined hunter. It will often bay out of excitement and won’t stop until it loses the scent of its object of interest. Living Environment – Basset Hounds have relatively low exercise needs, but you can help them keep fit when you give them a medium-sized yard to stretch their legs. Remember to have the area fenced. The breed’s impeccable olfactory faculty and sense of curiosity will lead the dog to wander away from your yard and get lost. Grooming – These dogs exude a distinct “doggy” odor about them. The breed is a constant shedder, but only requires minimal brushing to maintain the sheen of its short fur coat. Focus your grooming efforts on your pet’s ears, muzzle and nails. Though mild mannered, the breed’s tendency to drool and slobber makes feeding these dogs a messy event. Diet & Exercise – Bassets are notorious for their appetite (and the diarrhea that results from overfeeding them). Dog lovers say the breed almost always gets away with extra treats because of its endearing expression. You may want to keep a tab on the serving portions, however. The breed’s laid back lifestyle makes it a candidate for obesity. This dog breed’s obvious weight problem also makes exercise imperative. However, the exercise activities themselves can be minimal and need not be strenuous. Encourage the breed to move about in a fenced yard or to go walking with you. Health – Backaches, ear infections, glaucoma, foot cysts, and joint and bone problems are some of the chronic health concerns associated with this dog breed. Most of these issues are linked to the dog’s propensity for overeating and weight gain. Blood tests and eye checks are strongly recommended. If you savor challenges, you’ll get a dose of just that while attempting to train a Basset Hound. The breed is difficult to housebreak and is sensitive to harsh methods. It has a weakness for the exciting outdoors. Once the dog is hot on tracks, no amount of admonishment or enticement can break their concentration. Still, training this dog breed is not utterly hopeless. Under an expert trainer’s supervision, house training a puppy can take a minimum of 6 months to housebreak.